People involved in colour management know the importance of viewing proofs, prints and originals under controlled lighting, normally a viewing booth with D50 or 5000K lights. By attaching a RHEM strip to your documents, the person viewing can easily see whether they are working in good or bad lighting and take some action. The PIA/GATF RHEM® Light Indicator (Formerly Item No. 7065R) is a device for the visual control of color viewing. When attached to the border of a color proof or transparency, the Light Indicator will signal whether the viewer is judging color accuracy with or without a 5,000 K standard light source. Under standard lighting, the Light Indicator appears as a solid magenta patch. However, under non-standard light sources, the broad stripes of the two magenta metameric colorants that comprise the Indicator are readily apparent. The small patches, backed with a nonpermanent adhesive, can be peeled off and attached to the border of color proofs, color copy, color reproductions, or the sleeve of a transparency. Each patch measures 2x0.75-in. (51x19 mm). 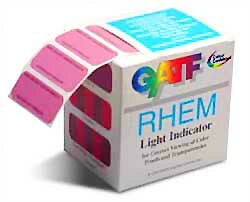 NOTE: The PIA/GATF RHEM® Light Indicators are sold in booklets of 50 stickers.